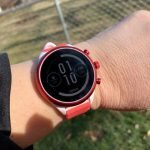 When the Garmin Instinct was first unveiled in later 2018, I wasn’t sure how it would fit in the large Garmin lineup of wearable devices. 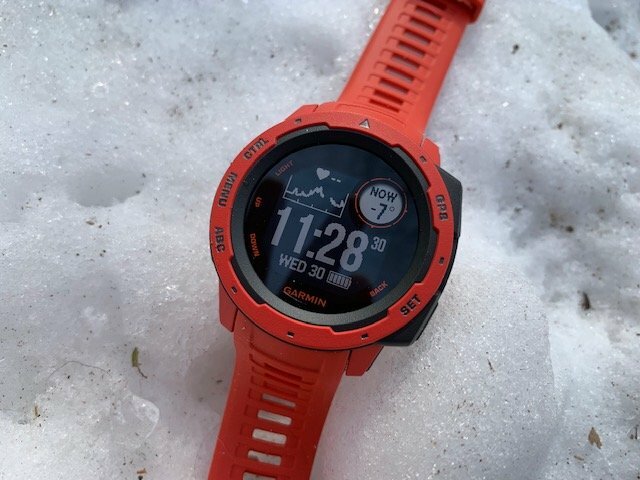 The Instinct has a military grade rating for durability and much of the guts of the much pricier Garmin Fenix. 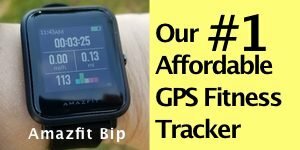 It certainly is similar to the Fenix, as it as many of its great hiking features but it stands on its own as a terrific GPS watch for outdoor enthusiasts. 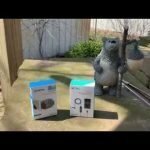 I review a lot of watches and some excite me more than others. I have my personal favorites. 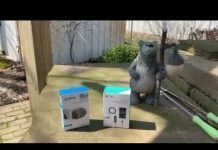 My main reason for reviewing the Garmin Instinct was because I noticed a lot of interest in it and a lot of glowing customer reviews. Yes, it is very reminiscent of an old Casio watch of the 80s or 90s. The monochrome screen is retro but very readable, especially outdoors. And I wasn’t sure what to think of the little circle display within the display. It seemed kinda gimmicky at first glace but it’s quite useful in the data it displays within other data screens. It’s a terrific feature of the watch. There’s a bit of a learning curve in operating the watch using its 5 buttons but once you get a hang of it it becomes second nature. I’ll be sharing tips and tutorials on how to use the watch. I haven’t been able to take it out on the trails just yet. Notice the temp on the pic down below! But I have tested how quickly GPS connects and it is lightning fast. One thing that I’ve noticed that has impressed me is the compass. It has the best compass I’ve used on any watch before. It’s accurate and extremely responsive to movement. With most I’ve used there’s always a bit of a lag as the compass readjust as I change direction but the Instinct is very fast at picking up which direction I’m going. Barometric pressure readings have been pretty much right on the money and the altimeter is within 20-40 feet accuracy so far in my testing. Elevation can be calibrated for greater accuracy. So I’m expecting great results when I go hiking. 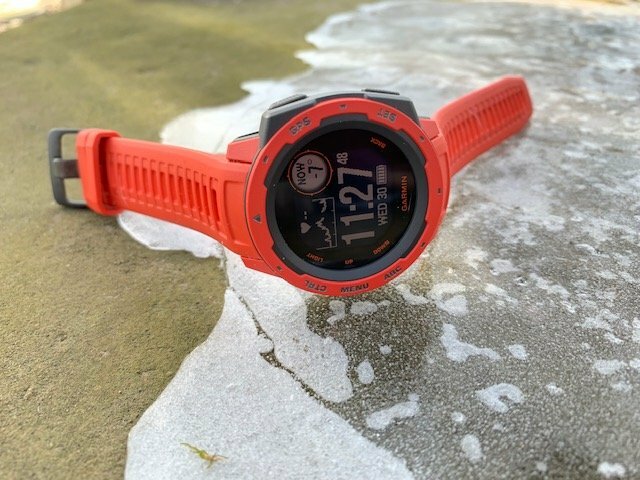 The Garmin Instinct – Military Grade Durability to withstand extreme temperatures and outdoor conditions. Like the Garmin Fenix, routes can be downloaded to the watch through Garmin Express. Garmin Express is a computer application for Windows or Mac. Once you have the application installed, plugging in your watch using a USB port using its charging cable will allow you to download firmware updates for the watch, custom activities, and routes. Actually, Garmin calls routes courses but I’ll probably refer to them as routes most of the time. The Garmin Instinct has breadcrumbing to help you visualize your tracks and help you stay on course when following a route that you may have downloaded. You can also use Track Me which is exactly like the name suggests and create a new route from it. It also has Back to Start so you can follow your track back to where you began your hike, run, etc. GPS locations can be saved on the watch and then you can navigate to them from the on-screen prompts. But we’ll be getting into all those great navigational features later with some video tutorials. You really have to see it to know what I’m talking about. I chose the flame red color for the Instinct and I love it. It’s an orange-red the stands out but not in a bad way. The Instinct is also available in black and gray. Even though it’s not a small watch, it’s lightweight and very comfortable. 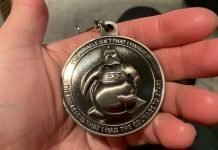 I can sleep while wearing it and not notice it. And yes, like other Garmin watches it has sleep tracking and it’s been accurate so far. It also has true 24/7 heart rate monitoring. 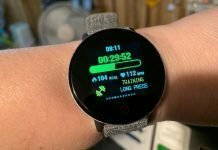 You can see your heart rate in real time on the watch if you choose. It will display your resting heart rate and a graph of your heart rate throughout the day. Missing from the Instinct is VO2 Max. I don’t know why Garmin didn’t include it because I’m sure the watch is capable of determining it. Music controls are on the watch, although music cannot be stored directly on the Instinct. Notifications have been coming through reliably and the Bluetooth connection has been strong. 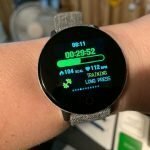 Setting up the watch was fast through Garmin Connect, Garmin’s mobile app. 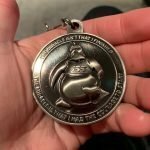 I have it paired with the iPhone XR and I’ve had no problems with syncing workout data. Like the Fenix and other Garmin watches, the Instinct can pair with Bluetooth and/or ANT+ external devices, like chest heart rate monitors. Battery life so far has been great. It promises 10-15 days of battery life and I think it will live up to those claims. Most of all, I’m just surprised how much I like the Instinct because I have the Garmin Fenix 5s. While there are certainly many similarities between the two watches, there’s a lot to love about both. The Instinct isn’t the poor man’s version of the Fenix. You’re getting a very good hiking watch in the Instinct if that’s what you’re looking for. There’s nothing cheap feeling about it. 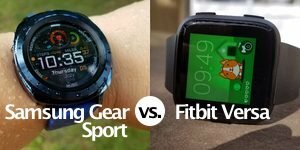 It reminds me a lot of the Suunto Spartan Trainer Wrist HR and I’m going to compare these two against each other in several tests. Both are geared towards hiking and outdoor activities and as I shared earlier that I have my personal favorites in watches, the Suunto, has always been one of my favorites. Its heart rate sensor has improved too. That was my biggest complaint with it. It’s also the watch that I use to compare others against for GPS accuracy because the Suunto Spartan Trainer WHR has been the most accurate GPS watch I’ve used. The Apple Watch Series 4 is right up there too and hopefully I’ll be adding the Garmin Instinct to that list. The Garmin Instinct is available on Amazon and other retailers. I actually got mine through Amazon that had been returned (box not even opened) and saved $50. That was a good deal! The full review of the Garmin Instinct will be coming, as well as those tutorials. First it has to get above zero outside. Oh, but spring is just around the corner. Thank goodness. 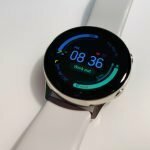 Previous articleFossil Sport Review – The Irresistible Wear OS Smartwatch!